Product prices and availability are accurate as of 2019-04-20 10:08:35 EDT and are subject to change. Any price and availability information displayed on http://www.amazon.com/ at the time of purchase will apply to the purchase of this product. Edward Elgar (1857-1934) and Benjamin Britten (1913-1976) each stood at the forefront of his respective generation of British composers. 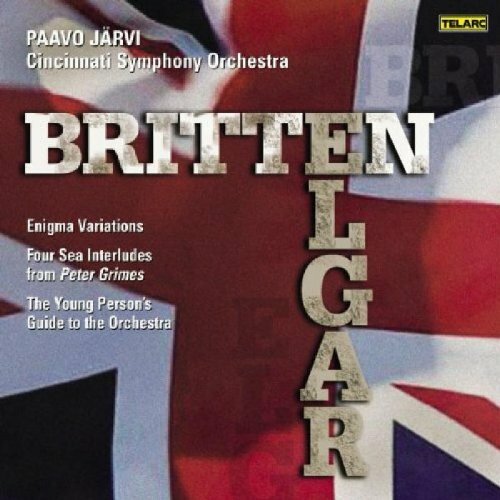 The success of Elgar's Enigma Variations spread awareness of his music to an international audience, while Britten's first full-scale opera, Peter Grimes, solidified his position as the most important English opera composer of the century. Both works are deeply personal pieces drawn from life experiences. Elgar began the Enigma Variations without a specific commission. He sent the completed score to Hans Richter, who conducted the first performance in London a year later. There was great buzz about the significance of each of the "enigmas," as Elgar hinted at a deeper aspect to each of the pieces. This has long since been resolved, and some of the enigmas represent sketches of the composer's friends and musical acquaintances, and/or portray incidents in which they were involved. Britten dedicated a large portion of his compositions to music with a youthful theme, from pieces like The Sword in the Stone and Simple Symphony to Young Apollo. He wrote The Young Person's Guide to the Orchestra for an educational film called The Instruments of the Orchestra, and designed the work for performance with or without narration (the performances on this recording do not include narration). Like Britten's other works for youth, it blends simplicity with sophistication. The subject of its variations is a theme from an earlier giant of British music, Henry Purcell. Variants on a hornpipe from Act III of Purcell's incidental music to Abdelazer are tossed from one orchestral section to the next. The Four Sea Interludes from Peter Grimes could be called a set of variations - not in musical terms, but as a series of related images. The `variations' were written at the same time as the opera and then later extracted as a suite. The Interludes depict the sea in its various states and at different times of the day, while carrying the drama forward through musical means between changes of scene.